We left Portugal by car in the early days of January and we reached Andorra two days later. For a while we followed the Segre river until we reached the reservoir, which looks like a majestic lake, by the town of Oliana, in Spain (near Lerida). The area is surrounded by sharp, rocky mountains. I took a few pictures of Nadia (our daughter) by the water with the village of Coll de Nargo behind. (I assume that is the name of town because there is no other close by in the region). The old houses of the village seemed to be clinging desperately to these beautiful shaped mountains, which in this time of day were glowing yellow and gold from the sunset. It is truly an remarkable place and worth stopping on your way to Andorra. 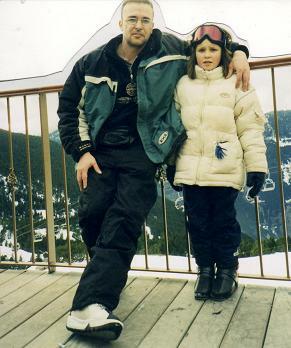 I came to this small country for one main purpose, that which was to ski and snowboard with my daughter. Unfortunately it took us a long time to get to the ski hill due to heavy traffic, this was the holiday season after all. Andorra la Vella, seemed to be a really busy place during the Christmas holidays, like any other major ski resort. This was the only day we could ski before taking the plane in Munich and I was nervous that I was going to miss my chance. While I was looking around, I could not believe there were any ski hills around, everything seemed so dry, so green and snow free. I first stopped at the ski station of Canillo. Once there they to told us that we could not ski because the world-class station was full. I also learned later that this hill was run like a club and space was limited. I pleaded with the employees saying that I was from Canada but they did not seem to care. They did not even suggest another resort. But, that’s exactly what I did; I went to another hill on my way to France. 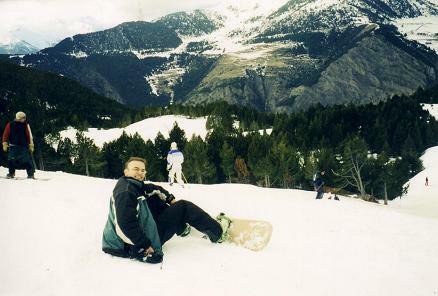 We found room and skied at Soldeu-El Tarter, a great resort. The lower slopes at the beginning of January were not white but green. We had to take a gondola to the top of the mountain fortunately when I reached this area called Espiolet there was plenty of the white stuff. 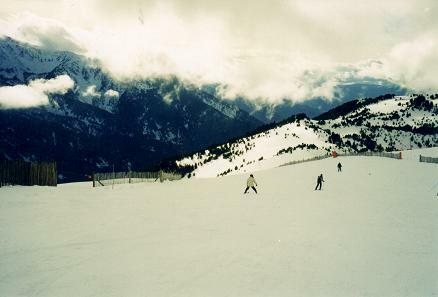 This station also connects with other skiing areas such as Pas de la Casa- Grau Roig. We did not go the latter because I was not sure if my seven-year-old daughter could handle it. The resort altitude is 1800 meters and the highest lift can be found at 2500 meters. The longest run is 8 km. You pay around 35 euros (2007) for a full day for an adult, which is not bad. There is also a well-organized ski school. We enjoyed sitting outside of their restaurant having a drink. We took some spectacular pictures from the terrace. This resort has a lot of easy runs; it is a good place to gain experience. I was snowboarding and I felt like a pro. I did not see too many super experienced boarders or skiers. I cannot recall but there were not too many double black runs. A lot of people were from Spain, Portugal and Eastern European with not much experience skiing. It was hot that day and some French skiers called the snow "Pisseuse". Yes, there is the word piss in it. In the context of the day I could understand that they meant slushy. I saw one of the worst falls of all time. Many people in this resort are beginners or low intermediates. I saw a guy going full speed, stiff as a phone pole. He fell and did few somersaults in the air. I was wondering if he had all his limbs intact. Ouch. It hurt just watching him. We took the gondola and I was really pleased with my afternoon. We headed to France satisfied of our enjoyable experience.